Vera's passport photo until 2016! If you are planning on traveling internationally with your baby (and if you are visiting this site, I assume you are), it makes sense to apply for your child’s passport as early as possible, as it’s valid for five years (yes, with the same picture!). If you are an expat like me and have a baby outside the United States, you must get a passport in order to take your baby home to America, and you will apply for a Consular Report of Birth Abroad at the same time that will serve as her official birth certificate. Last year, I wrote up an extensive report on Gadling of my experiences with the US Consulate in Istanbul getting all of Vera’s paperwork, and will distill the process here. Each consulate has different requirements, this is taken from the Istanbul consulate. If your baby was born outside of marriage and/or one parent is not a citizen, it gets more complicated. In addition to paying some fees, bringing your passports, and making an appointment for the whole family, you’ll need some paperwork. -Proof of birth: The foreign hospital should provide some kind of letter to show you gave birth. In Turkey, we were given multiple copies in Turkish and English. I also had to get a Turkish birth certificate for her foreign residency, see the Gadling article for more info on that. -Proof of marriage: We were lucky we packed our marriage certificate from New York, as they do ask for the official certificate. You will also need to show dissolution of previous marriages, but we were not asked for a divorce certificate from my husband’s first marriage; this may be more important if one of the parents is not a US citizen. -Proof of time in and out of the US: Depending on how much you travel, this can be time consuming. You are asked to provide precise periods of time both inside the US and abroad. Basically they want to see that one of the parents has fulfilled the residency requirements for citizenship (see the “complicated” link above), but I spent hours combing through our records to find all our travel dates just in case. You can download the forms online for applying for a first-time passport. You’ll need to apply in person with the child and both parents, and if you are outside the US, the forms and procedure may change, check this link for details and specific. We got Vera’s CRBA and passport in about two weeks at the Istanbul consulate, much faster than if we had applied for regular service in America, but give yourself plenty of time just in case. -Proof of US citizenship: your baby’s US-issued birth certificate, or if outside the US, you’ll apply in conjunction with the CRBA above. -Parents’ documents: Both parents will need to provide their passports or other qualifying documents, along with photocopies. 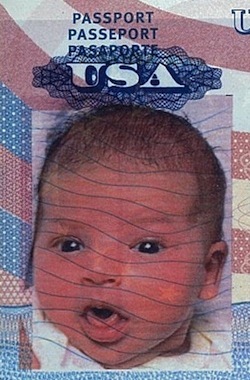 -Photo: The trickiest part of getting an infant’s passport is the photo. You will undoubtedly take hundreds of photos of your baby in the first few months, but getting a newborn to open their eyes and focus on the camera is easier said than done. I’d recommend going to a professional passport photographer who may have some tricks to use on babies, and you may need to try several times! This is one area where I really dropped the ball, and wish I had done things differently. Applying for a social security card after the birth can take a few extra weeks, but outside the US it can take 3-6 months! When a baby is born in America, the hospital can automatically apply for a social security number at birth along with the birth certificate. If you are outside the US (or didn’t apply at the hospital) you will need to apply in person and wait until you have some identification such as the passport and CRBA. Ideally, you should apply at a social security office when you are visiting the US, or at a US consulate as soon as you receive the passport. I waited until Vera was nearly seven months and I’m still waiting for the card, and there’s no way to get the number before the card is issued. Fortunately, expats are given an automatic extension on filing taxes, as we will be unable to claim her as a dependent until we get the number! -Child’s documentation of age, citizenship, and identity: I took her passport and CRBA. -Parent’s identification: Passport or driver’s license will work. Came across your blog when trying to figure out CRBA process in Turkey. How long did it take you to get the SSN? Thanks for the article! Hi Tristan, I applied in February and got it in July, so about five months. I think it can be much faster if you can do it in the US while visiting. I made the mistake of thinking it would be faster to do it at the Embassy, as many things are, like passport renewals. Good luck! Oh wow, I was planning to use my US address but I guess it would help at most 1 month. Was hopping to be done with it before April 15, considering I apply in December it might be done just in time. Of course taking baby’s passport (will check if SSA accepts passport card) and CRBA with me back is another option besides them being able to make the journey to US. Oh well decisions decisions, thank you very much! Finally made the application for CRBA and passport. Skipped the SSN application following your advice. I really got lucky with taking the passport photo with a newborn (7 days) 🙂 Do you remember how long it took to receive the CRBA and passport? From my interview it sounded like they send both together, CRBA takes 4 weeks and passport takes 2 weeks. Now I am wondering if this means it will take 6 weeks in total. Hi, how specific were you about ‘precise periods of time in the US’? Even vacations outside the US since birth?? I tried to be fairly specific, using our passport stamps, but the embassy didn’t seem to care so much. They really wanted to see that we had actually lived there recently. A friend born in the US but who hadn’t been there much as an adult had issues getting citizenship for her child born abroad, but I don’t know anyone else with issues.